I think I stopped exercising altogether in high school. Aside from the obligatory gym classes where I usually opted to do badminton (and not take it seriously), I was pretty well inactive. Then the years of study were upon me and by the end of my final school year that was all I ever did – school, study, sleep, repeat. I’ll be candidly honest – I got soft around the edges. I wanted to do something about it. For my body, and also for the way that I felt; I was sluggish, insecure and slow, when I wanted to be fit, strong and confident. I wasn’t even really sure where it went wrong. As a child, we run, play and push ourselves to our physical limits because it’s fun. Then it becomes something that you’re good at, or not. And as I grew, my classmates grew also. They became bigger and stronger than me, and a lot of them were a lot more practiced than me, and definitely more attuned to their bodies. We all became more aware of where we sat on the scale of things, and I found myself at the lower end of the scale, almost all of the time. I still remember the feeling of embarrassment and shame at getting picked last for a game of dodge-ball. I didn’t feel good enough at this thing called ‘physical activity’. I started to lose my confidence with it. I started to forget it was fun. It gave me a horrible feeling that was part shame, part embarrassment, part dissatisfaction, part cowardice, and all negativity. It was easier to ignore when I wasn’t trying to defy it, so I avoided situations where I would. But I still really wished I could. I can’t quite remember when I started to exercise more regularly. It happened very gradually, over a process of months and years, even. I started with things I would do in my everyday life like walking. In the summer, I took up swimming. I went by myself and at low-peak times of the day. I swam up and down between the lines of the lap lane, which was repetitive and almost always torturous at first. I counted down instead of up, because it made me feel like I was accomplishing more, and to my surprise, found the whole process quite therapeutic. I looked forward to my sessions in the pool, and started focusing more and more on the stimulation it provided me and the way it made me feel – physically, emotionally, mentally. I felt fitter, but I also felt stronger. I felt more confident, and more focused. I felt more secure within myself. I was reacquainting myself with how my body moved and what it could do for me. I stopped watching the numbers on the bathroom scales, and only scrutinized myself in the mirror every so often. One day I felt bold enough to try out running. It was still hard. 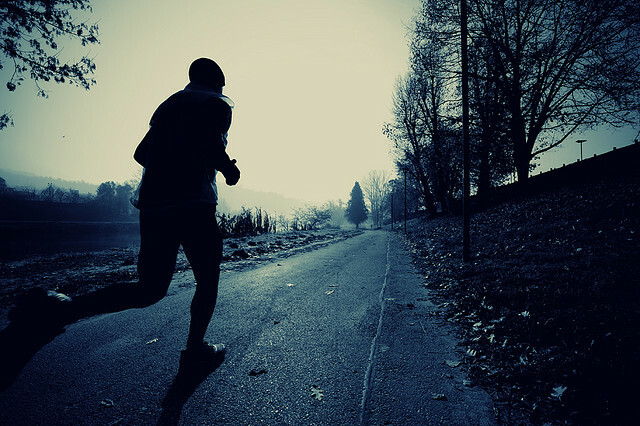 I still lacked motivation most of the time, and I never ran very far or for very long, but I ran. I now run regularly. I have a route that feels like the road home, and a great soundtrack that provides extra motivation. I don’t run very far by lots of peoples’ standards, but it’s far enough for me. I do run where people can see me. I run, but I don’t do it because I feel obliged, or because of how much I weigh. I run to feel my muscles and joints stretch and flex, to feel them propel my weight forward over the earth, to feel the strength in my body as I move, to feel my heart beat faster and my lungs work harder. I run to feel connected to every inch of my body, and to feel so intoxicatingly alive. I run because it makes me feel fit and healthy, strong and capable, confident and fearless. I run for fun. I run to let off steam. I run to remind myself that I can conquer my limitations. Now, I run because I know I can. Tags: attitude, body image, confidence, exercise, fitness, jogging, running, strength, you can. Bookmark the permalink. Fearless. I like it. Maybe I will try out running one day.